Hopes have been building that the ineffective global policy response to the slow-burning global growth crisis would be transformed, that belatedly policy would be coordinated across reflationary levers and there would be reduced reliance on monetary easing. The election victory of Donald Trump embodied this hope given his commitment to a fiscal stimulus. However, while the expected combination of looser fiscal policy, tighter monetary policy and faster growth in the US into 2017 has underpinned a surge in the USD, hopes for a broader global reflation are likely to be disappointed. Outside of the US, much of the G10 remains overly reliant on monetary stimulus. The latest example was the UK and the government’s Autumn Statement, or mini budget. We believe that the coming Brexit-related downside risk to growth requires a 2% of GDP fiscal stimulus, to augment the Bank of England’s August policy ease. In contrast, the government announced a tightening of fiscal policy over the coming 5 years and austerity remains it’s political leitmotif. 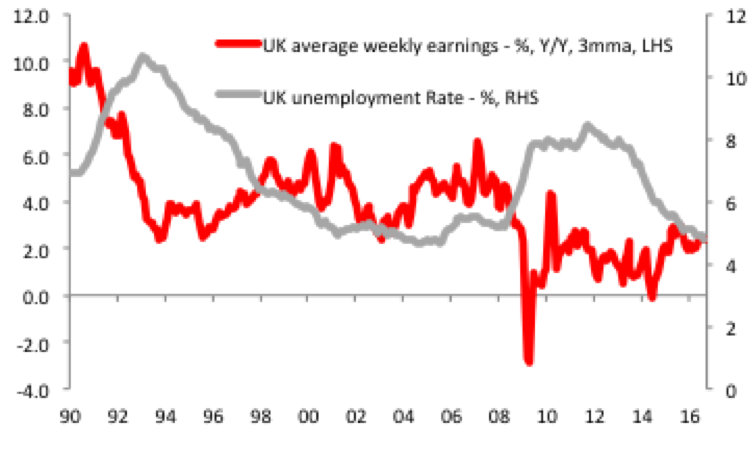 This adds downside risk to UK economic growth and to the GBP which we still expect to hear towards parity vs. the USD, while Gilts could be poised for a recovery. More broadly, the increasingly divergent policy mix of the US compared to other G10 economies is likely to help spur further USD appreciation against major currencies into 2017. It will also maintain a trend of weakening emerging market currencies. This policy bias is inconsistent with a sufficient recovery in economic growth and leads to a deflationary outcome. It also increases the potential for economic and financial market left tail risks as weak growth pushes economies that are highly leveraged to global growth to tipping points. (For example, see our analysis on China and Saudi Arabia). Moreover, we have been concerned with how the growing popular dissatisfaction with a lack of income growth can result in a reshaping of the body politic of countries, as the electorate grows frustrated with the lack of notable real income growth. The pace at which this latter risk has manifested itself has surprised even us given the recent shocks of the Brexit vote in the UK and the election of Donald Trump as US President. Political shocks to beget a more economically literate policy mix? For all of our concerns with respect to global growth, one possible upside of the Brexit vote and Trump’s victory was the potential for a switch to more economically literate policy response. Brexit, for instance, was heralded as ending the post-2010 era of austerity, which did so much to lower the pace of the UK’s economic recovery, reduce income growth, strain public services and contribute to the success of the Brexit campaign. Moreover, President-elect Trump is expected to launch a fiscal stimulus and easing of financial sector regulations that can help accelerate US economic growth. (Trumponomics – What if President-elect Trump does not pivot economically to the centre?). There are emerging signs that president-elect Trump may water down some of his fiscal plans. Most worryingly is the suggestion that he may include in his infrastructure spending some already planned projects that will be outsourced to the private sector and hence not prove additive to the baseline economic growth outlook. However, it is far to early to change our base assumption of a lift in US economic growth into 2017 and 2018. More worryingly, however, and as we warned at the time, it would be dangerous to extrapolate a policy shift in the US post-Trump to the broader global economy. In much of the G10, austerity still dictates economic policy. In Japan, while the focus is on when the government will launch the third arrow of Abenomics (structural reform) a more pertinent question is why the government will not launch the second arrow (fiscal easing) given that current overly tight fiscal policy is contributing to the weakness of Japan’s economy under Abenomics. (As for Generals so for Central Bankers: USD/JPY and the BOJ’s pro-cyclical policy framework.) In the Eurozone, the ECB remains the primary source of policy stimulus, as fiscal policy turns restrictive into 2017. The recent Autumn Statement by UK Chancellor Phillip Hammond also confirmed that despite the initial expectations, austerity remains the political leitmotif of the government, which has highly negative consequences for the outlook for UK growth and the GBP. Heading into the Autumn statement we already expected a divergence between what the UK economy requires and what would be delivered. 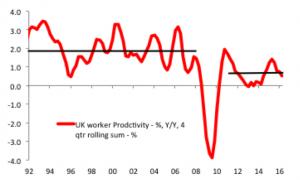 In terms of what is needed, we stick to our view that the downside risks to UK economic growth over the coming years requires a 2% of GDP fiscal stimulus. Ideally, this would be spread between infrastructure spending (which has the highest multiplier effect on GDP growth) and policies to help the consumer sector by reducing the coming squeeze on real incomes and helping to prevent the household sector from raising its saving ratio amid a more uncertain economic climate. A VAT cut would be the simplest way to achieve the latter objective. (The BOE delivers a Brexit ease. Now the baton has to pass to fiscal policy.) However, in the weeks leading up to the Autumn statement, Chancellor Hammond has been downplaying the need for policy stimulus, instead talking of the imperative to stabilise the public finances and leave room for future fiscal easing if required. 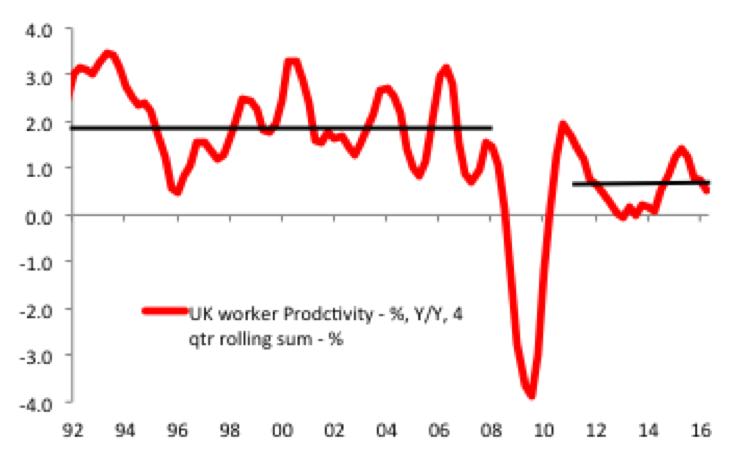 The latter viewpoint has been termed prudent in many quarters, but in fact has an element of recklessness to it given that the leads and lags of policy stimulus would argue for a pre-emptive easing in advance of what is highly likely to be a Brexit-induced slowdown in growth. What was delivered was even less that we were expecting. The centrepiece of the government’s economic assumptions was a £120bn increase in public borrowing over the next 5-years relative to baseline, of which Brexit-related factors accounted for almost half of the increase. 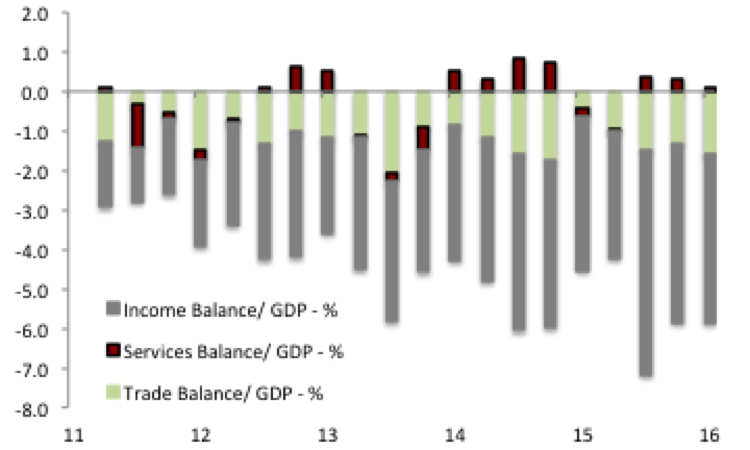 This fiscal deterioration framed the Autumn statement in that the government believed that it precluded the capacity to stimulate the economy via notably increased deficit spending. This conclusion rejects once more one of the lessons of the post-2010 period of global austerity: fiscal easing into a weakening economy can lead to very low increases in public debt relative to the counter factual of no stimulus if the policy action can limit the slowdown in growth and revenue. While the government announced mild forms of policy stimulus, the bulk of the expanded public borrowing requirement can be attributable to a weakening economy. By also failing to repeal the austerity measures already set in train by the previous chancellor, the net fiscal impact on growth over the coming 5 years will be restrictive. 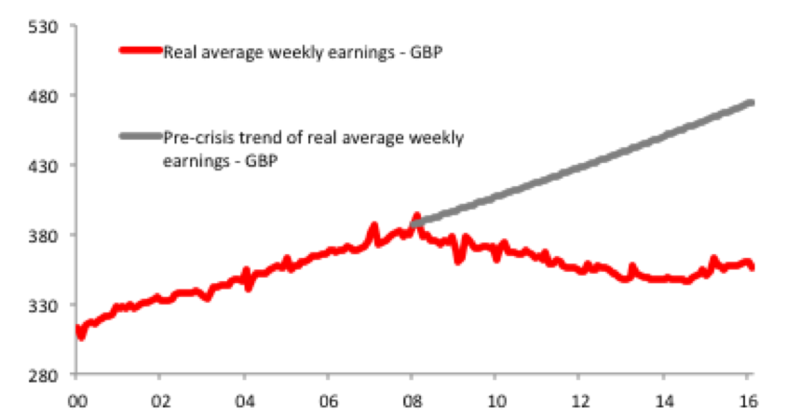 This can be shown by the chart below from the Office of Budgetary Responsibility (OBR). 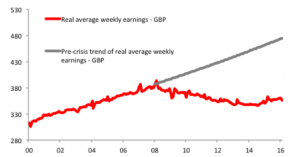 It shows the cyclically adjusted UK borrowing requirement. This is to drop from 3.8% if GDP in FY 2015/16 to 3.3% this fiscal year and fall to 0.8% at the end of the forecast period if FY 2020/21. The cyclical adjusted current budget deficit is also expected to fall from 2.0% of GDP in FY 2015/16 to 1.4% this fiscal year and rise to a surplus of 1.5% of GDP by FY 2020/21. Public spending cuts ahead. And further elector disenfranchisement? 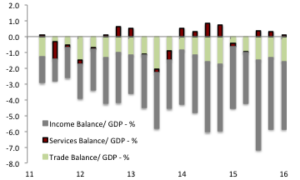 From a more medium-term perspective, the outlook for the household sector is made worse by the growing possibility that one consequence of Brexit will be a scaling back of public spending as public finances grow strained and as fiscal resources are allocated to supporting the corporate sector and key strategic industries such as automobiles and finance. (PM May has already stated an ambition that the UK have the lowest corporate tax rates in the G20.) As an aside, this raises questions as to whether the UK body politic is due for another restructuring. Many working class voters supported Brexit due to expectations of improved access to public services and higher wages. If the actual outcome is a squeeze of disposable incomes and reduced public spending, then the sense of disillusionment that spurred many to support Brexit could increase, and lead to even more unpredictable political outcomes. However, this is a risk for another day. Chart 4. 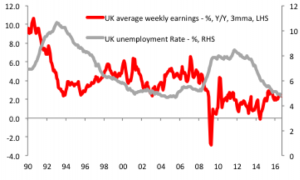 UK wage growth is at half pre-crisis levels despite a strong labour market recovery: labour lacks pricing power. Despite the pronounced slide of the GBP since Brexit, we still favour short GBP positions, and continue to see GBP/USD as the optimal expression of this view. The economic backdrop to the UK remains extremely weak, and the policy mix is both insufficient to offset the economic shock of Brexit but is also in increasing contrast to that is the US: “Trumponomics” entails loose fiscal policy that will increase the possibility of the US Fed implementing the tighter monetary stance it so desires, and a loose fiscal/ tight money policy stance is an optimal mix for an exchange rate; the UK for instance has a tight fiscal/ loose money policy mix which will support a divergence of the US and UK business cycle into 2017. 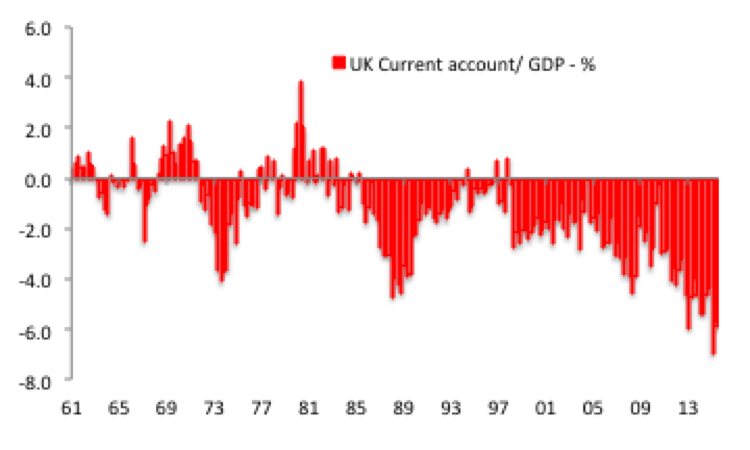 The outlook for the GBP will be further clouded by what is likely to be a very slow narrowing of the UK current account deficit (5.9% of GDP in Q2 2016) in response to the weak GBP and the UK economic slowdown. 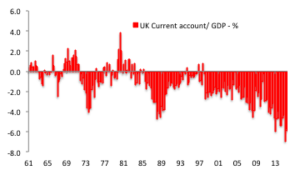 This reflects how the driving force behind the UK current account deficit over the past decade is a widening of the income deficit, and that is less sensitive to FX or business cycle dynamics. (Charts 5 and 6.) We continue to believe that GBP/USD has the potential to move closer to parity, having revised our original post-Brexit forecast of 1.20 in light of the growing probability of the UK adopting a “hard Brexit”. 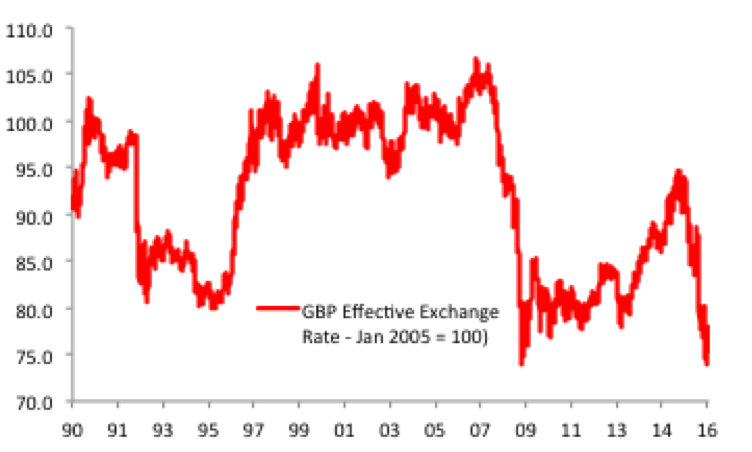 Similarly, the government’s overly tight fiscal stance will add to the downside risks to the UK and, by forcing a reliance on monetary easing, argues that Gilts may now be a buy following the post-Brexit selloff, especially since BOE Governor Mark Carney has been able to overcome government trail balloons regarding the benefits of reduced bank independence. 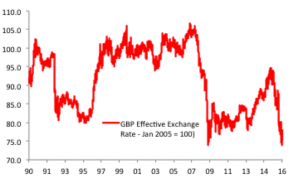 Moreover, by being consistent with the BOE’s monetary anchor, carney has eased market concerns that monetary policy would be focussed on supporting the GBP in order to reduce import prices: Carney will not target the GBP, and instead focus on any emerging second round inflation effects stemming from the import price surge. We have not changed our medium-term forecast of 10yr Gilt yields moving below 0.5%. Relative policy dynamics argue for a larger “Big USD” move. Chart 7. The GBP has further to fall, despite it’s already precipitous post-Brexit decline. This entry was posted in Emerging Markets, Event Risks and Left Tail Events, Fiscal Policy Activism, Growth Crisis, Income Lite Recovery, Monetary Policy Expansiveness, Opportunities and Right Tail Events, Regulatory Impact by Des Supple. Bookmark the permalink.